Right-angle weave, Linda L. Jones designed her cuff (above) with a side edging of teardrop beads, which adds movement and a bit of width. The other cuff has a more symmetrical look (right). 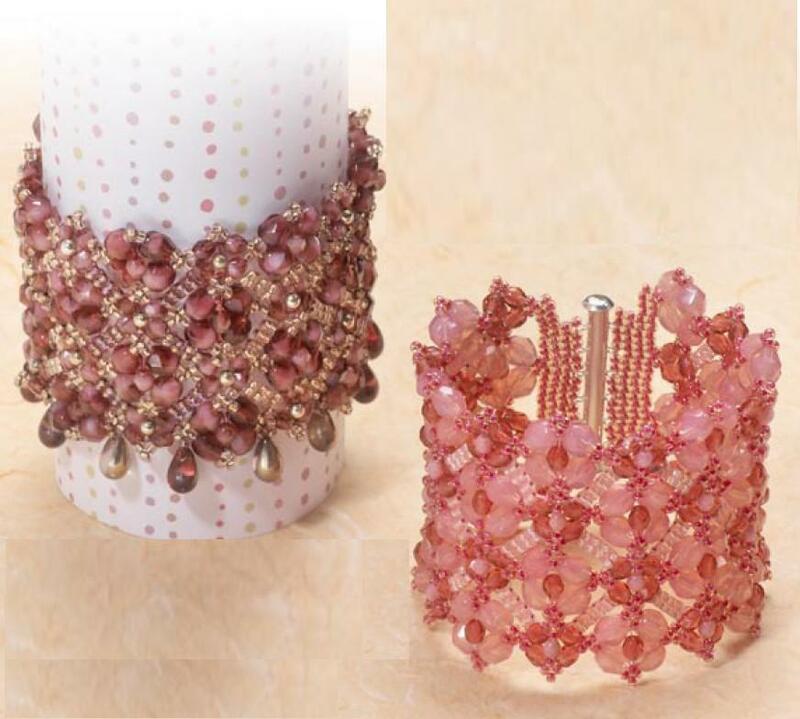 Embellished, modified rightangle-weave units create an open base that is filled in with ladder-stitch sections Designed by Linda L. Jones MATERIALS bracelet 71/2 in. (19.1 cm) 10 6 x 9 mm teardrop beads Czech fire-polished beads 966 mm 1204 mm 24 3 mm Czech fire-polished beads or round silver beads 5 g size 11 Q seed beads in each of 2 colors: A, B multistrand slide clasp (Rio Grande, riogrande.com) size D nylon beading thread to match bead color beading needles, #12 This dramatic cuff bracelet looks complicated, but it’s only a few simple stitches combined one layer at a time. Due to the nature of each technique, the thread can show in some places, so it is important to use thread that closely matches the color of your beads. Although this lends itself to a more monochromatic color scheme, you can use more than one color of thread if you want more contrast. stepbystep After completing the base of right-angle weave units, you will add four rows of square stitch and a clasp to each end. This will add about 11!z in. (3.8 cm) to the length. Keep this in mind if you are using a different type of clasp. Base  On 3 yd. (2.7 m) of thread, pick up an alternating pattern of a 6 mm fire-polished bead, and three color A 11 Q seed beads. Repeat three times (figure 1, a-b). Leaving an 18-in. (46 cm) tail, sew through the 6 mms again, skipping the As (b-c). The As should form points. If they don’t, use your needle to coax them into position as you gently pull the thread to snug up the As. Sew through the next 6 mm and two As (c-d). Begin a 4 mm fire-polished-bead unit by picking up an A, a 4 mm, three As, a 4 mm, three As, a 4 mm, three As, a 4 mm, and an A. Sew back through the A your thread exited in step 2 and the first A added in this step (figure 2, a-b). Sew through the 4 mms again, skip¬ping the As (b-c). Sew through the next 4 mm and two As (c-d). Continue working in modified right-angle weave, adding one more 6 and 4 mm unit (figure 3, a-b). Flip your beadwork and work another row of alternating 6 and 4 mm units as shown (figure 4, a-b). Continue adding rows of alter¬nating units until you have 11 rows or you reach the desired base length. Exit the center A on the end unit of one of the vertical rows (figure 5, point a). Pick up eight As and sew through the center A at the end of the next end unit (a-b). Repeat two times (b-c). Work a square stitch (Basics, p. 106) off the previous row using an A (c-d). Continue back across the row working in square stitch and using As until you reach the other end (d-e). Sew through the beadwork to exitpoint f. Work 20 square stitches off the previous row using As (f-g). Using As, work the last row in square stitch, incorporating the clasp into the beadwork by sewing through each loop on the clasp as you get to it instead of adding an A (photo). Sew back through the last row, secure the working thread in the beadwork with a few half-hitch knots (Basics), and trim. Repeat steps 8-11 with the tail. Embellishments Center embellishments  Secure a new thread (Basics) in the beadwork and exit figure 6, point a. Pick up a 3 mm bead. Sew through the opposite 4 mm, the next three As, and the 6 mm in the next unit in the vertical row (a-b). Pick up a 4 mm and sew through the opposite 6 mm, the next three As, and the 4 mm in the next unit in the vertical row (b-c). Continue adding 3 and 4 mm beads to the centers of the 4 and 6 mm units until you reach the end of the first vertical row. 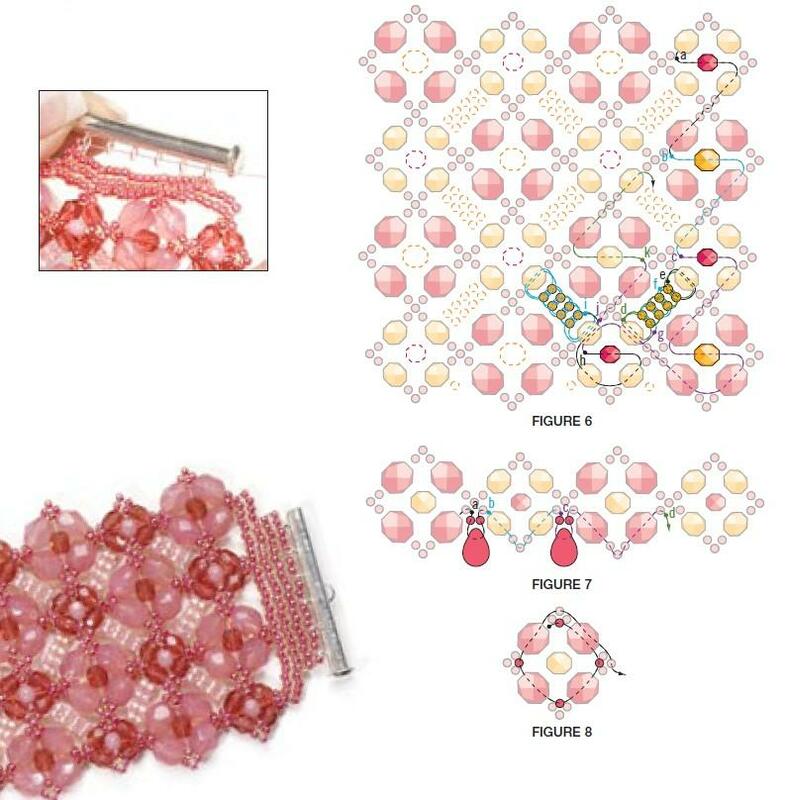 After adding the center embellishment to the last unit, sew through the beadwork to exit point d. Ladder-stitch sections  Work four ladder stitches (Basics) using two B 11 Q seed beads per stitch as shown (d-e). Connect the ladder section to the next 4 mm unit in the previous vertical row by sewing through the 4 mm and the last two Bs in the ladder twice (e-f). Weave back through the ladder to reinforce it (f-g). Sew through the next two 4 mms (g-h), pick up a 3 mm, sew through the opposite 4 mm, and continue through the next two 4 mms (h-i). Work a ladder stitch section as in step 1, and connect it to the next 4 mm unit in the next vertical row (i-j). Sew through the next three As and 6 mm in the next unit in the same row G-k). Add embellishments to the center of each 4 and 6 mm unit, and ladder stitch sections to all the internal 4 mm unit beads. Secure the tails in the beadwork and trim. Teardrops  Secure a new thread in the bead¬work and exit along one edge of the bracelet (figure 7, point a). Pick up an A, a teardrop bead, and an A. Skip the center A and sew through the next A (a-b). Sew through a 4 mm, three As, a 4 mm, and the next A (b-c). Pick up an A, a teardrop bead, and an A. Skip the center A and sew through the next A, 6 mm, three As, 6 mm, and the next A (c-d). Continue adding teardrops between the edge units until you reach the other end. Secure the tails in the beadwork and trim.Contact Linda at (902) 477-1379, thatjoneswoman@gmail. com, or visit her Web site, bornunderabeadsign. blogspot.com.